Do you want to know how your newsletter subscribers found you? Did they read a blog post and decide to sign up, or did they click on your signup link in your Twitter bio? With MonsterInsights, you can easily track form submissions and discover the referral source from which your newsletter subscribers arrive. In this article, we’ll show you how to track form submission in Google Analytics and discover where your newsletter subscribers are coming from. Your email list is the biggest asset of your online business. When a visitor fills out a form on your site, they’re taking the next step in their customer journey. That’s why it’s so crucial that your newsletter campaigns are optimized for conversions. Below are a few benefits of tracking conversions of your newsletter signup forms. It tells you how well your list building campaigns are performing. You can discover more details about your subscribers like their referral traffic source and their conversion path. You can also compare different list building campaigns to learn which one is bringing more signups. Google Analytics doesn’t allow you to track conversions of your email signup forms out of the box. 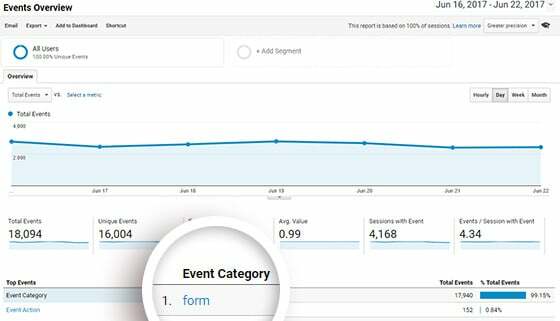 To track conversions of your forms, you need to manually set up event tracking on all of your forms. Setting up event tracking for all of your WordPress forms can be a hassle if you’re not using a list building tool like OptinMonster. With OptinMonster, you can easily track your campaign conversions and conduct A/B tests to find the best optin form variation. If you don’t use OptinMonster, MonsterInsights Forms addon makes it easy. The MonsterInsights Forms addon allows you to easily gather conversion data of your signup forms even if you’re not a developer or an Analytics expert. All you have to do is install and activate the addon. It just works without further configuration. The Forms addon works with any WordPress forms plugin, whether it be WPForms, Gravity Forms, etc. Setting up the Forms addon can be a big time saver. You don’t need to mess with code to set it up on all of your signup forms. For that reason, it is the best choice for bloggers and small businesses. No additional settings or configuration required. Upon activation, it works out of the box. 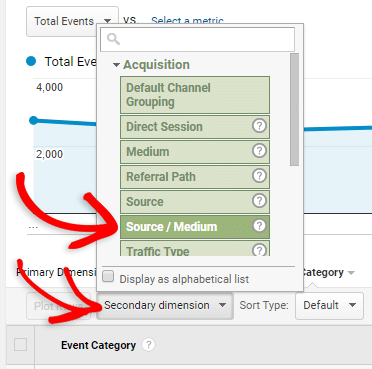 To find the conversion report, you need to look at the events tab in your Google Analytics profile by navigating to Behavior » Events » Overview. If you’re using the MonsterInsights Forms addon, you can click on your form under Event Category for more details. If you’re using OptinMonster and have connected it to Google Analytics, you’ll see your individual campaigns listed here. Click on the name of the campaign you’d like to see data for. To find how your subscribers arrive at your site, you can choose Source / Medium as the secondary dimension. Then you’ll see a list of your top traffic sources. We hope this guide helped you get some insights on tracking your newsletter form submissions. If you enjoyed this article, you may also want to read how to find your most profitable email campaigns.